Did you know that the most used search engine after Google is not Yahoo or Bing, but YouTube? With roughly 1.58 billion users worldwide as of 2018, it is clear that there is an audience on YouTube for every niche topic. And wherever people’s attention goes, there is money to be made, right? That seems to be the case, with success stories of YouTubers turning their channels into money machines, simply doing what they love. Earning a living from your passion is an appealing premise for many, but is YouTube really the best platform for producing content and making money off it? In 2018 and beyond, should you go after the YouTube money? This is the most well-known way to make money from YouTube videos. Google displays ads on a YouTuber’s videos and pays him or her 55% of the collected ad revenue. 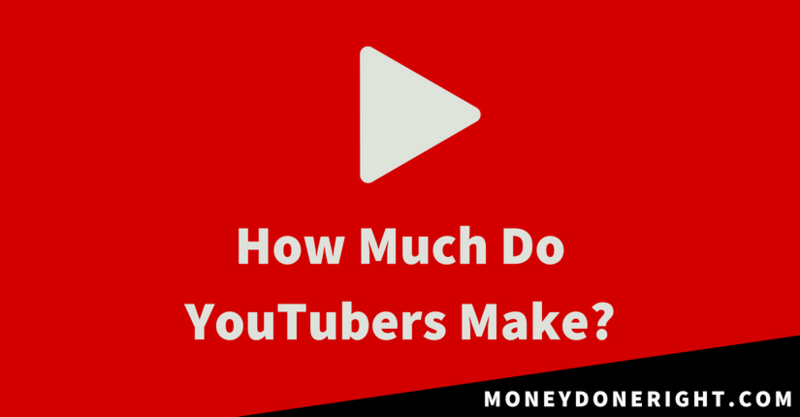 How much a YouTubers makes in total depends largely on the number of views and ads displayed. Estimates vary but the general ballpark goes from $3 to $10 per 1,000 views. However, one should keep in mind that a large number of viewers have Adblock and similar extensions installed on their browsers, so the videos they watch will not be converted to advertisement money. Nevertheless, the YouTube app runs ads freely, thus mitigating the effect of ad blockers. A business pays money to get its product promoted in a video. The YouTuber becomes a brand ambassador and uses his or her influence to drive more sales. Products can range from supplements to applications, solutions for website building and hosting, etc. Depending on a YouTuber’s popularity and the offers he gets, he may make more money through this method than with ads. But it comes as no surprise that freshly started and small YouTube channels will have to wait until their channels become big enough to benefit from this opportunity. More and more YouTubers resort to financing their activity through the use of platforms like Patreon or PayPal. The most dedicated fans contribute with varying amounts of money at set intervals to keep the channel going. But most of the time, the income generated is too low to substitute that of a conventional job. Fan donations help more to support the channel itself rather than the creator, who simply liberates the time needed to keep making videos. Considering that only a small number of subscribers become “patrons” for the creator, a channel needs to reach a certain size before it can gather these benevolent fans. YouTubers who have managed to build a strong and popular brand can generate a more or less decent volume of sales with merchandise like hats and t-shirts featuring their names, images, and slogans associated with them. But this option, like fan donations, remains profitable to YouTubers with a massive following, and a young channel should not expect to convert a tiny audience into customers. Starting a YouTube channel to promote your own business (products, one-on-one coaching, etc) can be a good idea, but that’s only if you can build a sizeable following. The would-be YouTuber should be prepared for years of creating content relentlessly before reaping decent benefits. Running a channel as a hobby and seeing how it performs in the long run is a realistic approach, as opposed to quitting one’s job to venture into the YouTube world. While Pewdiepie enjoys nearly 64 million subscribers and a net worth ranging between $30 and $50 million, he is an exceptional case and not a model that can easily be replicated. The reality of how much most YouTubers make is actually much less glamorous. A research done by Bärtl reports that — assuming the income equals $1 per 1,000 views — a YouTuber who makes it to the top 3% most-viewed channels will barely surpass the U.S. federal poverty line of $12,140 for a single person. Meanwhile, we started our blog in 2017 and went on to make over $25,000 per month. Click here for our latest income report where we give you a breakdown, including screenshots, of how we make money from the blog you’re reading right now. This result was achieved thanks to multiple ways of monetizing our blog and a highly engaged audience. It is well known nowadays that a new YouTuber cannot monetize their videos right away and that there are requirements that must be met. Since January 2018, YouTube made changes to the YouTube Partner Program (YPP for short). This means that new YouTubers will have to keep making videos for free until they reach this threshold and become eligible for monetization. A channel that reaches these metrics will be reviewed automatically by the YouTube team. It is thus becoming increasingly harder for new YouTubers to grow their channels and make money off it. These changes of rules are criticized as frequent and handicapping for up-and-coming YouTubers who feel that the effort far outweighs the reward. In addition to that, numerous YouTubers reported that their videos were demonetized due to bot errors. YouTube’s tendency to make ad revenue further from the reach of new and small names seems at odds with their initial message of enabling everyone to share their story. At the end of the day, the one thing that is certain for content creators is that they have to play by the rules that YouTube decides. The bigger levels of popularity on YouTube go to boisterous figures capable of providing non-stop entertainment. YouTube fame is for people willing to show their face 24/7 and share some of their lives with millions. This means it will be much harder for a person who is naturally quiet and reserved to get a big number of viewers excited about her content. And it goes without saying that it is easy to see through someone faking a fun persona. Furthermore, becoming a YouTube star is not without its risks and one wrong word can stir huge controversies. When YouTube personalities make a mistake, the news outlets will blow the issue of proportion and potentially ruin the YouTuber’s image. Videos get demonetized and business partners shy away from new deals. Other forms of content creation offer more freedom and less unwanted attention. You have complete control over a platform you own and your audience doesn’t need to see you every day. If you are someone who finds it easier to express himself or herself through writing, you will feel right at home with blogging. Click here to read about how we make money blogging. It is no secret the number of videos posted on YouTube is getting harder to fathom with each passing year. On a single day, people watch over 1 billion hours of video. Furthermore, with YouTube’s “Recommended” feature, there is an infinite supply of videos to consume. The problem for a creator is that YouTube is recommending to her audience videos of others YouTubers who might be her direct competitors. Everyone is competing for attention, and it becomes more difficult for YouTubers to retain the limited time of their audiences. Contrast with other forms of content creation like blogs or podcasts where you decide what comes up on the visitor’s browser tab. Having your own website means that there is no competitor content on the corner of the screen; it’s just you and your audience. There is also the rise of videos with “click bait” content that needs to be taken into account. The war for attention drives creators to come up with irresistible video titles to steer audiences to their channels. Once hooked by an enticing title and thumbnail, viewers often consume low-value content that, in many cases, consists of comments on current news with little insight, redundant content, or outright false information. Then you have the fact that not all subscribers are notified of newly uploaded videos. You have to explicitly ask viewers to click on the notification bell next to the subscribe button so that they can get notified whenever you upload a new video. Because YouTubers often forget to mention this or do not do it frequently enough, and viewers do not notice the bell button on their own, many of their videos rack much fewer views than they could. All of these factors show that in 2018 and beyond, making money on YouTube is only going to become harder, with the competition for the finite attention of audiences growing harsher. With a relatively young audience, videos being available to the large public and little to no moderating, the YouTube comment sections grew a reputation of being rather toxic and negative. While you can potentially reach a wider audience on YouTube, not all people who watch your videos will share the same vision that you have. People who stumbled upon your video and who are not among your intended audience may voice their disagreements in less than friendly ways. Viewers who write with a civil tone and strive to add value to the conversation are often eclipsed by strong opinions, jokes and the occasional back-and-forth arguments that degenerate into name calling. This is not to say that YouTube is devoid of thoughtful viewers who add value and goodwill, but the bad tends to overshadow the good. And as a channel gets bigger, a YouTuber may not be able to personally answer the all the comments that show appreciation. But between fiery comment sections and inquisitive media, popular YouTubers face a lot of pressure and some of them YouTubers end up experiencing burnout. At the same time, levelheaded people are still searching for in-depth articles where they can take their time and digest information at their own pace. For a mature audience, a blog is a perfect place to create value and offer products and services. It is is a more intimate space where the sense of community is stronger and the conversation more constructive. The blogger’s bond with his “tribe” can be further strengthened through a newsletter or even a private Facebook Group, two channels that don’t mesh well with YouTube audiences. And as shown with our most recent blog income report, blogs are not only alive and well but they also make for a great source of income in a relatively short time, provided you know how to run a blogging business. While subscription numbers in the tens and hundreds of thousands are impressive, only a portion of subscribers is actively engaged with the content being created, and an even tinier portion will convert to customers. While the average net worth of the most popular YouTube stars is indeed staggering, we would wager that you are not exactly into vlogging or playing video games. If you don’t feel comfortable with the idea of speaking in front of millions for years, the YouTube scene may not be for you. And relying on fan donations is not most effective the business strategy either. Starting a YouTube channel with the goal of making good money is an investment that requires several years of continuous work with a probability of success that goes lower as the platform gets saturated with content. With that in mind, one should consider alternate types of online business, ones that allow making much more money with a much smaller audience, in much less time. A blog allows you to connect with readers even if you are not a particularly charismatic person. You can build different, steady sources of income while bypassing the noise of YouTube and grow your brand on a platform you own. Click here to check out our income report to get a detailed breakdown of how we make money from our blog. DO YOU WANNA RECOVER YOUR HARD EARNED MONEY ON BINARY OPTIONS?? ?